Don't look for me. It was a simple instruction. And for six long years Carter Blake kept his word and didn't search for the woman he once loved. But now someone else is looking for her. He'll come for you. Trenton Gage is a hitman with a talent for finding people - dead or alive. His next job is to track down a woman who's on the run, who is harbouring a secret many will kill for. Both men are hunting the same person. The question is, who will find her first? If you like page-whirring thrillers with an enigmatic, action-oriented central character (ala the exciting series from Lee Child, Zoe Sharp, Simon Kernick, or Ben Sanders), then you definitely want to give the Carter Blake tales from Mason Cross a go. Although Cross is Scottish, he sets his Carter Blake books in the United States. Don't Look For Me, the fourth in a burgeoning and very good series, is largely set around Las Vegas and the American southwest. Having finally shrugged off much of the lethal shadow cast by his former association with the secretive 'Winterlong' organisation, Blake is enjoying something of a sabbatical, when his past unexpectedly comes calling. He receives a message to one of his old email addresses, an address he'd only given to a woman who meant a lot to him, but had disappeared from his life years before. 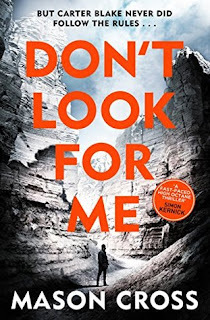 'Don't Look For Me' was the note that Carol Langford left Blake (who she knew by another name, and whose actions had put her in grave danger), several years ago. And Blake, despite his talents for finding those who don't want to be found, had respected Carol's wishes ever since. Until now. But the email isn't from Carol. Instead, it's journalist turned crime writer Sarah Blackwell who's reached out to Blake, having found his email in a notebook left behind by her neighbour Rebecca, who vanished one night along with her husband Dom, after an altercation at a neighbourhood party. Sarah is worried about her newfound friend, and once he learns more, so is Blake. Why have Rebecca and Dom vanished? What has been happening in the years since Blake gave his email address to Carol, and she disappeared without a trace? Cross delivers an action-packed ripsnorter of a thriller, where Blake finds himself up against some talented and well-financed adversaries. Plenty of suspense, violent action, tension, and twists blend into a propulsive narrative. This is a one-sitting read that keeps the adrenalin high, while still delivering some nice shading with character and setting, elevating it above plot-based potboilers. I tore through this in a few hours, and immediately wanted to read more Carter Blake.